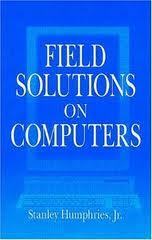 Field Solutions on Computers covers a broad range of practical applications involving electric and magnetic fields. The text emphasizes finite-element techniques to solve real-world problems in research and industry. After introducing numerical methods with a thorough treatment of electrostatics, the book moves in a structured sequence to advanced topics. These include magnetostatics with non-linear materials, permanent magnet devices, RF heating, eddy current analysis, electromagnetic pulses, microwave structures, and wave scattering. The mathematical derivations are supplemented with chapter exercises and comprehensive reviews of the underlying physics. The book also covers essential supporting techniques such as mesh generation, interpolation, sparse matrix inversions, and advanced plotting routines.